Hi there! A super speedy post today from me! 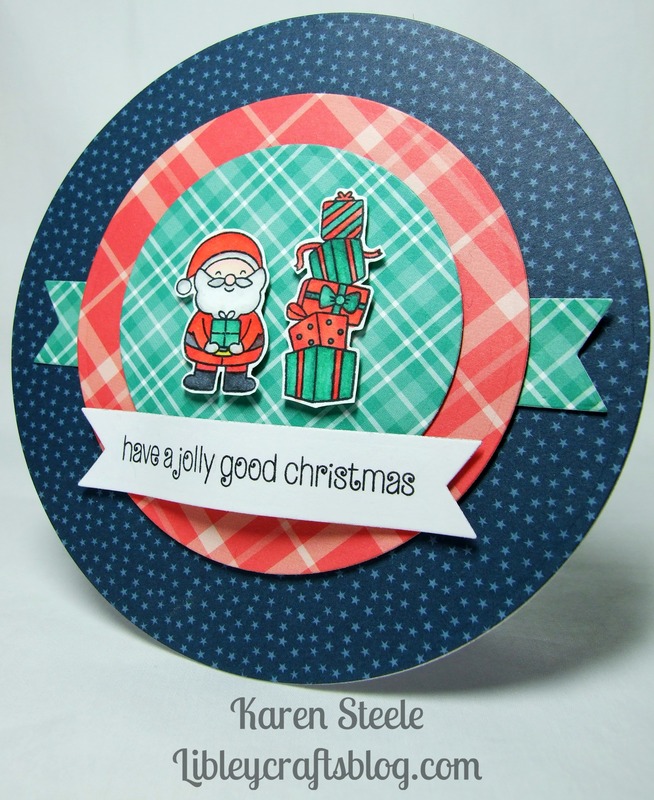 This card has been made using Clearly Besotted’s Santa Baby stamps. Clearly Besotted are closed for the rest of this year but will hopefully be open again early in the new year. I also used:- Spellbinders Grand Circle Dies, Lawn Fawn Everyday Sentiments Banner Die, Kaisercraft Banner Die, Lawn Fawn papers Perfectly Plaid Christmas and Beachside. Memento Tuxedo Black inkpad and Spectrum Noirs to colour. Great paper choice and shape Card, Karen. The little Santa is totally sweet. I also hope Clearly Besotted reopen ! Such a fun card with Santa and the presents, Karen! Love the shape of the card and the pretty patterned paper, too! Fun color choices and papers! I like the shape of it too. I never do that anymore – I resolve to do one soon! Sorry I’ve been absent lately, I’ve been away on holiday and now I’m waiting for mr mojo to get back home as well… In the meantime I’m trying to catch up a bit on what’s been going on in blogland. How come we don’t do circle shaped cards more often? I love them, and here you’ve used a great mix of patterned papers too. Great job! Thanks so much Pia! I saw a Lawn Fawn You Tube video where Kelly made a circular card and that’s what inspired me to make one! I think this card is only the second or third circular one that I’ve ever made! So nice you have made a circular card. I love the shape. Again as always, your pattern combinations and colour choices are sublime. You always give me inspiration. Super card! Thanks so much Gill 🙂 You’re too kind!